Savvy Apps is well known for taking Apple’s stock apps and improving them – the company has enjoyed success with Agenda (a powerful calendar app) and Buzz (a slick replacement for Apple’s contacts app). Today, the company launches a new iPhone app — Today Weather — with (you guessed it) a focus on telling you everything about what the day ahead holds for you in terms of wind, rain, sunlight or snow. You may have guessed from the name but Today Weather has a complete focus on what is happening over the next 24 hours, drilling down into hourly reports that arm you with the information to dress appropriately for the commute to work, or if you live somewhere with a bit more of warmer climate, how little to wear. Opening the app, Today Weather will locate your iPhone and display the weather in your current location, allowing you to add more from its main screen. 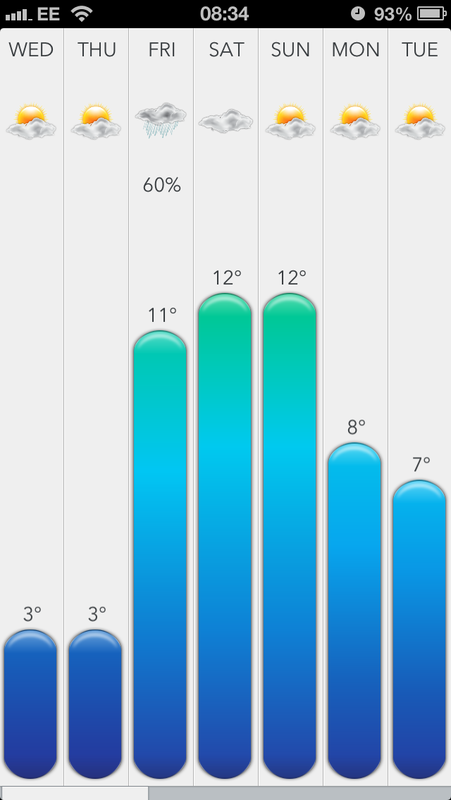 At all times, Today Weather will display the current, high and low temperatures over the course of that day, with a percentage indicator displaying the chances of rain. I spent a lot of time thinking about a better breakdown for weather information. That’s why Today goes from long term planning (“Forecast view”), to the day (“Today view”), to more detailed information (“Hourly view”), while also including a snapshot across all locations via the Dashboard. I also wanted 100% focus on the content with little to no chrome taking attention away from that (e.g., a settings button present everywhere). When you select your chosen location from the main screen, Today Weather will display a simple scrolling animation, notifying you that you will be able to use up and down swipe gestures to move between different places. You can even use a pinch gesture to take you back to the main location listing if you so wish (alternatively, the app provides a small arrow at the bottom right which performs the same action). From the forecast view (shown on the left of the two images below), it’s a simple right swipe to view the ‘Today view’ (shown on the right) and a left swipe provides a seven day forecast, complete with clever indicator bars that show how the minimum and maximum temperatures expected for that day. 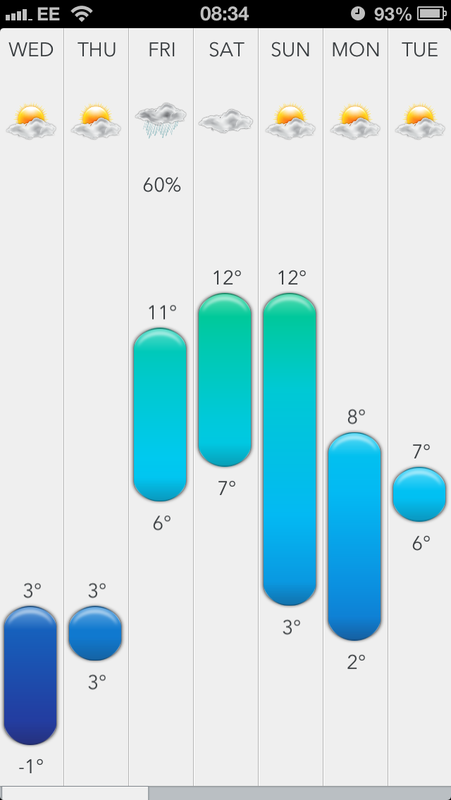 As discussed above, Forecast mode displays a breakdown of the weather for the next seven days. By default, Today Weather will display the coldest and warmest temperatures expected for that day, but if you prefer to know just the maximum temperature, then a time tap toggle will switch the view. The toggle is in place to suit “normals” and “geeks” says Yarmosh. In tests, the standard view was preferred by females and non-techies, while the geek mode was preferred by males and those that have a thing for weather apps. You may have noticed that the background color of the app screenshots shifted from a dark slate to light silver. Today Weather is aware of the time and will adapt the background to display a lighter color if it detects the sun has begun to rise where you are currently. 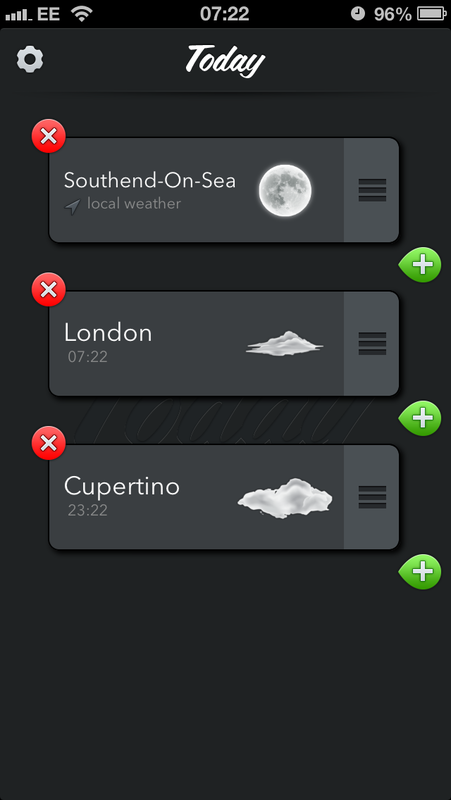 While it was light in Southend-on-Sea (in the UK) at the time of this review, over in Cupertino, California, it was near midnight and the app displayed a dark theme when the location was selected. 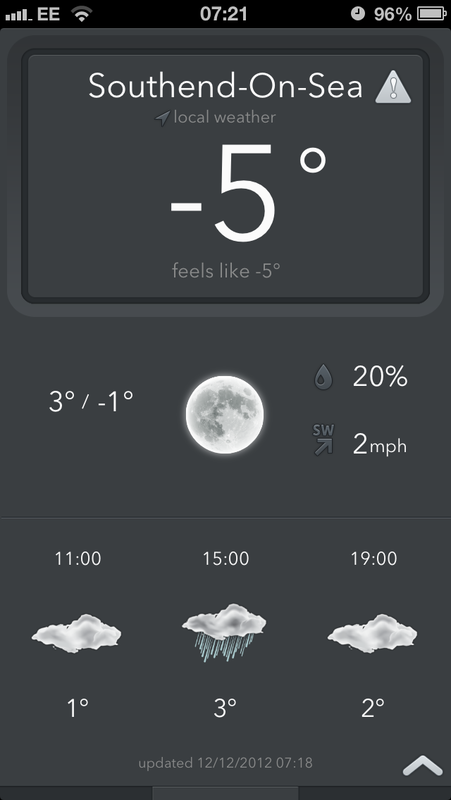 The app can toggle between Celsius and Fahrenheit and displays in-app notifications for important weather alerts (check the screenshots above for a warning sign, it tells me that in the UK today there are icy roads and low-visibility due to fog). To date, Savvy Apps has seen over 300,000 downloads and more than 2.6 million updates of its two stock replacement apps – Agenda and Buzz (launched in July 2011 and February 2012 respectively). Agenda has been featured by Apple on the App Store multiple times and Buzz was also featured on launch, breaking into the top 50 of the “Paid” apps of the entire App Store. Overall, Today is a very slick and powerful weather app. There are more comprehensive apps that provide satellite overviews and fly-by animations, but if you want to know what it’s like outside at this very moment or later in the day, Today has your back covered. 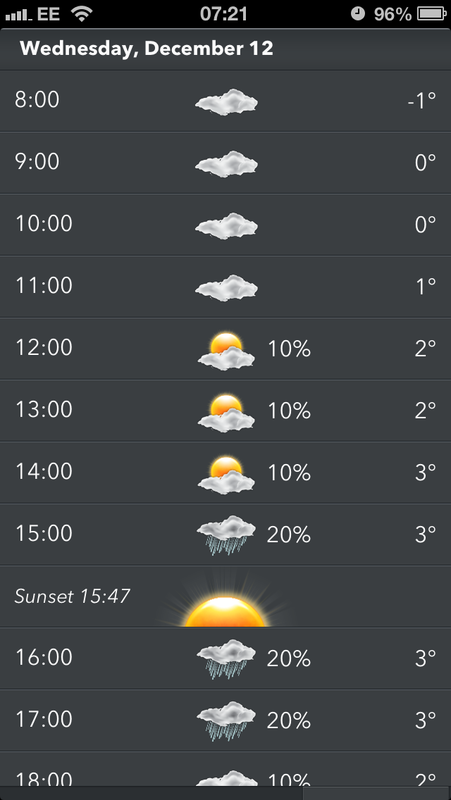 Today Weather is a $1.99/£1.49 download from the App Store and is available on iPhone and iPod touch. You can download it using the link below.